After a decade hosting The Late Late Show, Craig Ferguson has a new late-night gig, this time with a historical spin. 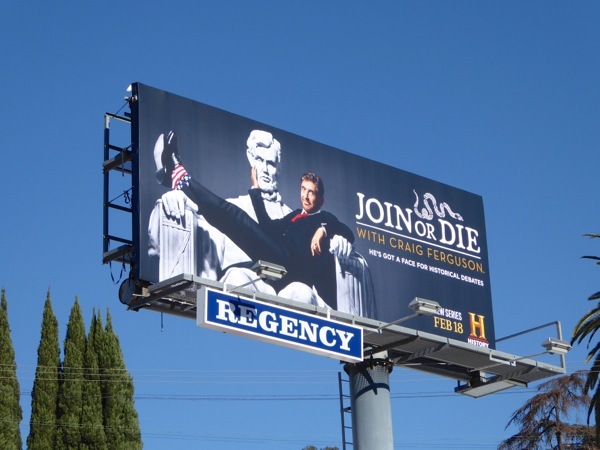 Join or Die with Craig Ferguson will see the unorthodox comedian inviting celebrity guests and experts onto his show to chat about provocative current events and influential historical topics. 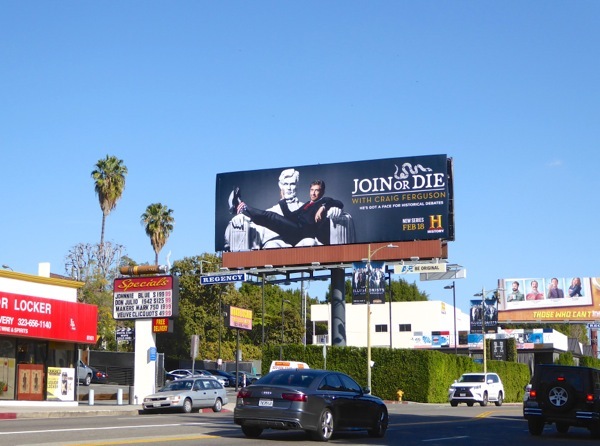 The new series takes its name from Benjamin Franklin's infamous 'Join or Die' 1754 political cartoon (the snake-like artwork shown in the logo), which served as a rallying cry for divided colonists, which the Scottish-born Craig Ferguson had tattooed on his forearm when he became an American citizen. 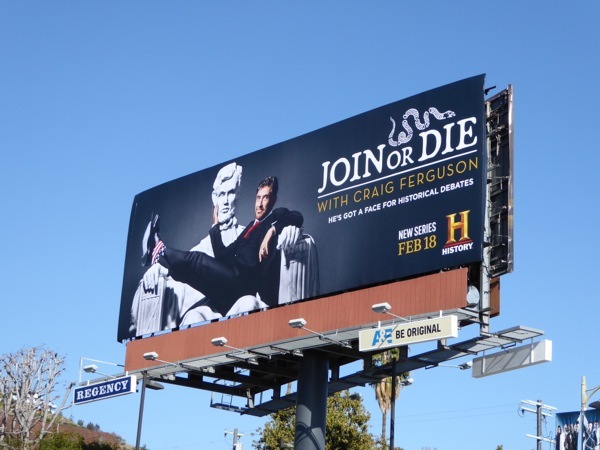 Ferguson cupping the face of the colossal Abraham Lincoln statue in Washington, D.C. in the ad creative and the tagline, 'He's got a face for historical debates', helps convey the mix of levity, politics and history the show will embrace. 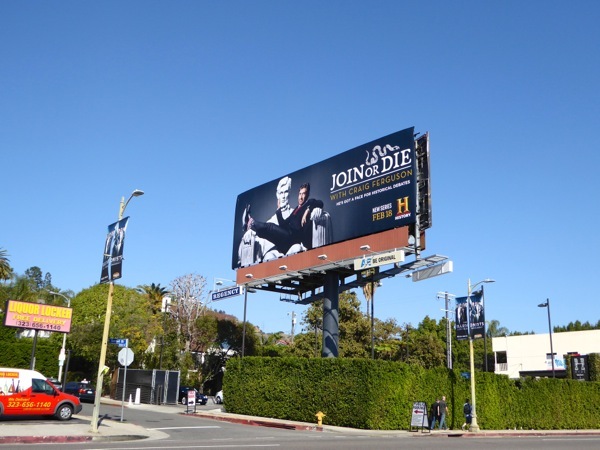 The standard landscape billboard for the series launch was first spied along Fairfax Avenue on January 20, then later along Sunset Boulevard on January 24, with the smaller ad spotted further west along the Sunset Strip on February 5, 2016. 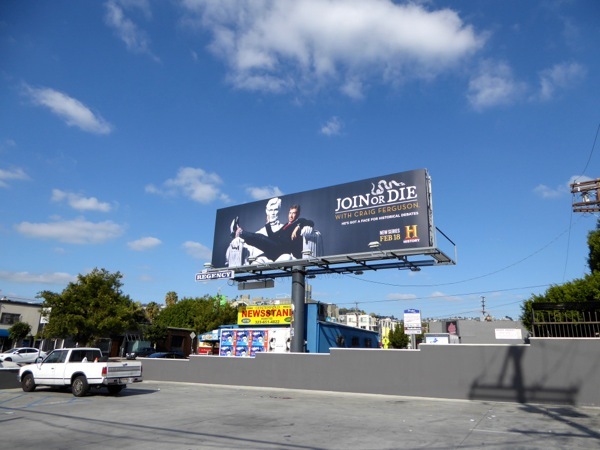 For more fun with national monuments, be sure to also check out these Veep season four Mount Rushmore billboards and these Curb Your Enthusiasm Statue of Liberty parody billboards. Will you be joining in the conversation tonight when the show premieres?